If one was to seek the quintessence of the Golden Harvest martial arts film (wuxia if you prefer), one would have to look not much further than “Iron Monkey”, a film that encompasses all the elements that made the genre so popular, starting with the people in charge, whose names include Yuen Woo Ping, Tsui Hark and Donnie Yen, among others. Let us take things from the beginning though. In another episode from folk hero Wong Fei-hung’s life, whose heroics have been immortalized in films the “Once Upon a Time in China” series, “Drunken Master”, “Magnificent Butcher” etc, the very young at the time Wong meets Iron Monkey, as he travels with his father Wong Kei-ying.. Iron Monkey is actually the alter ego of a traditional Chinese medicine physician called Yang Tianchun, who, in a combination of Zorro and Robin Hood, dresses in black every night, punishing the corrupt officials of the area, and particularly Governor Cheng, and giving their spoils to the poor. However, when father and son first arrive in the town, Kei-ying is tasked with capturing the Iron Monkey, after a series of unfortunate events that lead to his son held hostage by Cheng. As the merchants in the area refuse to have anything to do with the newcomer, since they consider the Iron Monkey their hero, an exhausted and extremely hungry Kei-ying ends up in Yang Tianchun’s house, where the doctor and his wife (? ), Miss Orchid take care of him, even helping him release his son from the jail Cheng has put him in. Their clash seems inevitable, but eventually Hin-hung, an Inspector for the government arrives in the area with his team, and everything turns upside down. Let us start with the obvious. The action scenes in the film are impervious. Yuen Woo Ping, who is also the action director has come up with a number of more than impressive choreographies, taking advantage of his protagonists’abilities, as Donnie Yen in his 30s moved like a lightning while Lee Fai (White Eagle, one of Hin-hung’s disciples) and Angie Tsang (Wong Fei Hung) were Wu Shu champions. Furthermore, the wirework, the stunts, and the special effects are more than impressive, with Yuen Woo Ping not shying away from the blood and violence, even when the receivers are children and women. Arthur Wong and Tam Chi Wai’s cinematography is impressive, with their camera following the action as closely as possible. Furthermore, with the combination of Ringo Cheung’s production design and Ng Bo Ling’s costumes, the presentation of the era is quite accurate, both in the slums and in the palace. Chi Wai Chan, Angie Lam and Marco Mak’s editing induces the film with a very fast pace, which also extends to the non-fighting scenes, in a tactic that heightens the entertainment aspect of the film even more. 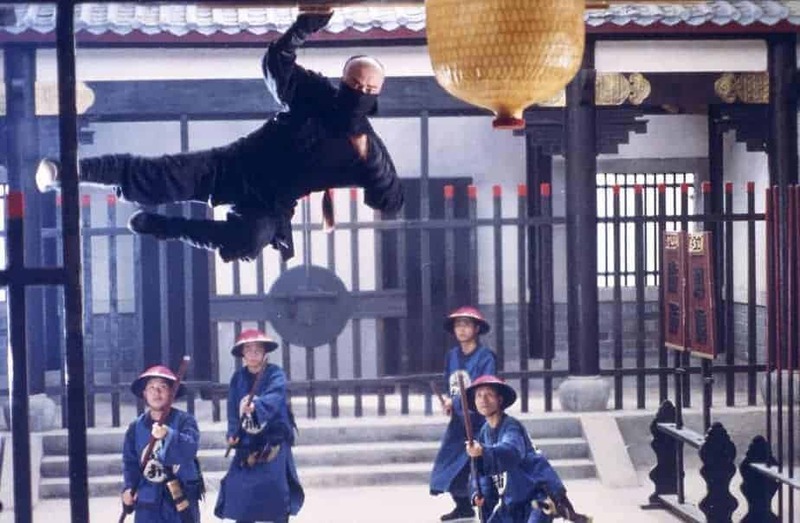 Furthermore, most of the archetypical elements of the wuxia are here, as the film includes corrupt officials, beautiful women, fights in roofs, the naming of the techniques used, shaolin monks, and impressive entries by both the villains and the protagonists. Add to that some elements of slapstick humor, a bit of drama, and you have the backbone of a true wuxia. However, what sets “Iron Monkey” apart is that the political comments are quite frequent and pointy, with the script highlighting the corruption of the officials and their neglect of their subjects in the harshest fashion. The scene where Cheng is wondering about a way to raise money to buy another position is a distinct sample of the fact, along with his practices, which show absolutely no concern about the living or dying of the people in the area, but also his employees. As is usually the case in the category, the acting serves the action scenes, for the most part. However, it is definitely on a much higher level here, than it is usually the case. Donnie Yen is quite convincing as the father in distress, while Rongguang Yu as Iron Monkey emits kindness and dignity from every pore. Gorgeous Jean Wang as Miss Orchid provides the necessary female aspect with gusto. The ones who steal the show though are the villains, with James Wong appearing as sleazy as possible in the role of Governor Cheng, while Yen Shi-kwan is great in the archetypical role of the majestically evil, as Hin-hung. Lastly, Yuen Shun-yi as General Fox, the head of Cheng’s guard, is the mains source of comedy in the film, rather successfully. “Iron Monkey” is a masterpiece of the genre (to say the least) and a film all fans of wuxia and martial arts in general should have in their collection. The release from Eureka is excellent, in both image and sound, while the extras are more than interesting, as they include interviews with almost the whole cast, and even martial arts exhibitions from Angie Tsang and Lee Fai.